ST. LOUIS — Searching for the ideal stamp to complement that special occasion? The U.S. Postal Service today issued two Celebration stamps fit for party invitations, thank-you notes, announcements and any other correspondence. The stamps were dedicated during a first-day-of-issue ceremony at the Missouri Botanical Garden. The Celebration Corsage and Celebration Boutonniere Forever stamps are beautiful and perfect for greeting cards, Father’s Day cards and other occasions. 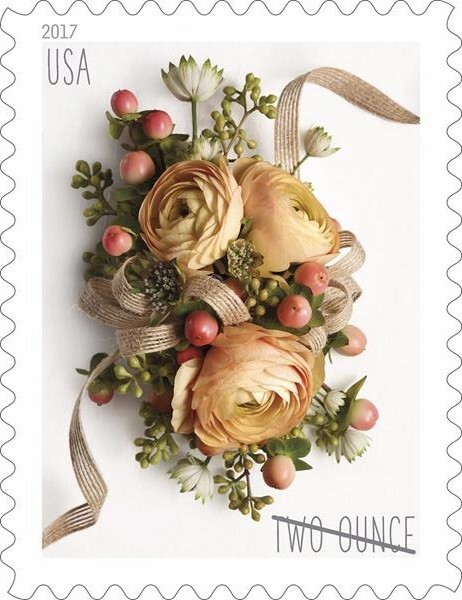 “The Celebration Corsage and Celebration Boutonniere Forever stamps reflect the Postal Service’s long and proud tradition of showcasing flowers and floral artwork on stamps. Literally hundreds of floral-themed stamps have been released over the years — depicting an astonishing variety of flowers,” said Guy Cottrell, chief postal inspector, U.S. Postal Service, who dedicated the stamps. “We are pleased to dedicate these beautiful stamps to commemorate any special occasion from birthdays to anniversary and prom celebrations. Cottrell was joined at the stamp dedication ceremony by Dr. Peter Wyse Jackson, president, Missouri Botanical Garden; James Miller, senior vice president, Missouri Botanical Garden; Cathy S. Vaughn, Postmaster, St Louis; Carol Caggiano, floral designer and Ethel Kessler, art director. Celebration Corsage is a 2-ounce stamp appropriate for many of life’s special moments. This elegant stamp can typically accommodate the weight of heavy invitations for birthdays, weddings, anniversaries, and other celebrations; oversized greeting cards for all occasions; and mailings such as small gifts that require extra postage. The corsage is an arrangement of ranunculus with accents of hypericum berry, Astrantia, and seed eucalyptus. The word “corsage” is French and originally meant the bodice of a dress, where small bouquets were pinned. The term bouquets de corsage shortened over time to “corsage.” Along with boutonnieres for men, corsages were fashionable for daily wear in earlier centuries, particularly during the 1700s and 1800s, but gradually they began to be worn mostly on formal occasions. Today, corsages are worn by mothers of the bride and groom at weddings and by the honorees on Mother’s Day, birthdays, anniversaries, Easter, proms or any special occasion or event. 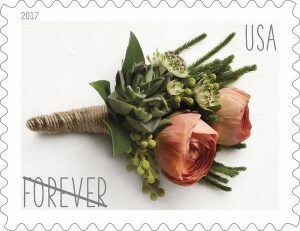 Celebration Boutonniere is a First-Class Forever stamp intended for mailings that require a little something special. It can be used on RSVP envelopes often enclosed with wedding invitations. It is also ideal for party invitations, thank-you notes, announcements or any other correspondence. The boutonniere is an arrangement of ranunculus, with floral accents of succulents, Astrantia, Berzelia and clubmoss greenery. For centuries, boutonnieres — or buttonhole flowers, as they were called in Britain — were a staple of a well-dressed man’s outfit. For most of the 20th century, a single flower pinned to a lapel or inserted into a jacket buttonhole was part of a sophisticated, debonair man’s wardrobe. Still very fashionable today, boutonnieres are worn at weddings by the groom, groomsmen, father of the groom, and best man and at other special occasions, including proms, anniversaries, retirement parties or military memorial services. The Celebration Corsage stamp art features a photograph of a floral arrangement of ranunculus with accents of hypericum berry, Astrantia, and seed eucalyptus. The soft peach petals of the ranunculus contrast with the rougher textures of the greens and grays of the accent plants. The ribbon that twines through the corsage adds an earthy texture as well giving a visual sense of movement in the arrangement. The Celebration Boutonniere stamp art features a photograph of an arrangement of ranunculus, with floral accents of succulents, Astrantia, Berzelia, and clubmoss greenery. The ribbon wrapping the stems harmonizes with the colors and textures of the plant material. Both stamps were arranged by floral designer Carol Caggiano, photographed by Renée Comet and designed by Kessler. Followers of the U.S. Postal Service’s Facebook page can view streaming video of the first-day-of-issue ceremony at facebook.com/USPS. The public is asked to share the news on Twitter and Instagram using the hashtag #CelebrationStamps. Customers may purchase the Celebration Corsage and Celebration Boutonniere stamps at usps.com/stamps, at the Postal Storeusps.com/shop, by calling 800-STAMP24 (800-782-6724) and at Post Office locations nationwide. A variety of stamps and collectibles also is available at ebay.com/stamps. After applying the first-day-of-issue postmark, the Postal Service will return the envelopes through the mail. There is no charge for postmarks up to a quantity of 50. For more than 50, customers are charged 5 cents each. All orders must be postmarked by July 2, 2017. 563010, Digital Color Postmark Keepsake, $15.95. 563021, Digital Color Postmark, $1.85. 563310, Digital Color Postmark Keepsake, $11.95. 563321, Digital Color Postmark, $1.64.